Obama, who has consistently praised Bush for the way he's handled his ex-presidency, faces a conundrum about how to handle his own. Though he’s vowed to ensure a smooth handover of power, Obama is keenly aware he's being replaced by a new president who holds antithetical views on issue after issue. The president spoke out vigorously throughout the campaign against Trump’s calls for banning Muslim immigrants, deporting millions of people living in the U.S. illegally, repealing “Obama­care,” and canceling the Paris climate deal, to name a few. Those policy proposals and others like them have stoked fear for many Americans who oppose Trump and are hoping vehement opposition from Obama and other Democrats might prevent Trump from implementing them. Yet Obama suggested that while he might not always hold his tongue, his goal wasn't to spend his time publicly disparaging his replacement. “You give them a hearing,” said Obama, whose own Supreme Court nominee, Merrick Garland, has lingered for more than half a year due to the GOP's insistence that no Obama nominee be considered. 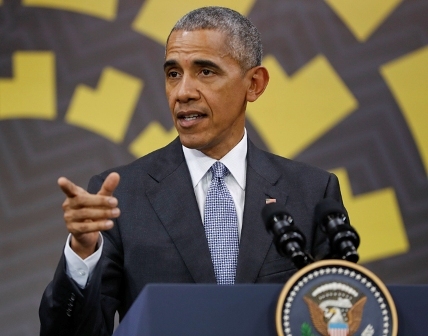 Obama said he certainly didn't want Democrats to adopt that tactic spearheaded this year by Senate Majority Leader Mitch McConnell, R-Ky.